The book arrived and I will be starting my review. I plan to split the review into three parts to cover this introduction, the first six chapters and finishing up with the last six chapters. 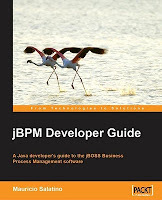 The jBPM Developer Guide is a PACKT publishing offering, which is publishing books on technical subjects for sme time now. They offer good quality books, with nice artwork and feel to them. This one is 350 pages and feels like you should be able to carry it with you as a reference guide to jBPM. PACKT is based in Birmingham, UK but the Credits page lists a team that contains the author (South American), a proof reader, two reviewers (South American) and a list of editors (India mostly). After reading the Preface I was wondering what these people all did, for they surely can not be proud of the English used. Please don't get me wrong, it is English that is correct, but it is definitely English from a non-native speaker. This is a shame as it degrades the reading experience and is sometimes even down right annoying. I would expect proof readers, reviewers and editing teams to take more care with the final results. not sure the author has experienced "life in the trenches" with jBPM? 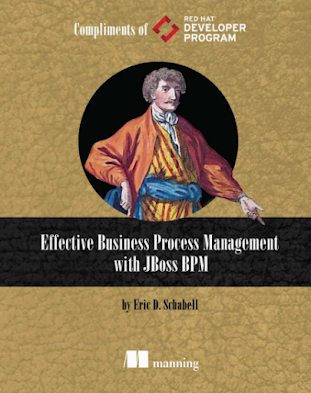 why is the focus only on jBPM 3.x and nothing is said about jBPM 4.x, the only actively developed version of jBPM at the time of this books writing? Well, it is always good to review something with some initial questions, so stay tuned as I explore the book further in the coming weeks. I am English non-native speaker too. I will read the new book soon and I am sure that will be a good read. First off I am not an English native speaker, well but it might works as my second language sometimes, and as "a second language" obviously I may have many many mistakes, which imho is quite acceptable once in my country the spoken language is the Brazilian Portuguese. My concern is that your 2nd or 3rd parts are definitely useless, once you are very clear in your report that you are suffering reading this book, the writing (Never forget: "English as a Second Language"). 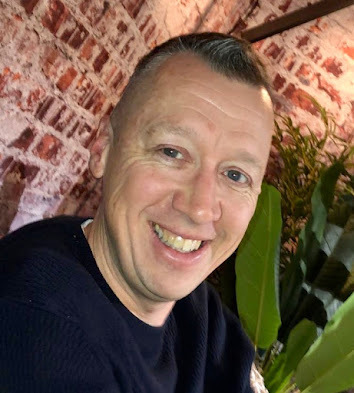 Well, my thought is that if you are a really a super JBPM guy, the community would love to read your lessons, experiences, concepts and very high level examples, codes and so on.... So my friend, as community member, we are missing your book at this moment! So when you decide to sit, and expend about 6 months of your time writing, maybe you will be able to write any book reviewing. As you said my friend in your post: "Don't get me wrong". Sorry my friend, but the "opensource concept" provides for places like South America, Central America, Africa, Asia and so on, a way to try to get a seat on the Technology sphere, I am proud Brazilian, and I respect you pretty much. My main objective in my answer is not to create an enemy,but just try make you to rethink your concepts... BTW, one of the JBoss.ORG slogans is "Open your Mind" !!! I was surprised to read someone pretty close to the community and Red Hat that seems to doesn't understand the concept of a community contribution. I'm not saying that you need to say that my book is the best thing in the world. I wrote this book because I want to learn about how to write a book, and because I want to give something back to the community. I recognize my mistakes, I will work harder in my English, I will try to put homework in all the chapters, but you need to recognize that writing books, as any kind of community contributions are better when the community gets involved. For that reason I prefer to get a big list of erratas to the next version of the book. In software is the same, or should I say that jBPM is a very bad framework because it's in the 4th version? It would be nice to see more "bad" books that people from the community write, to have different points of views to choose, that nothing because aggressive reviews scare all the community members. I'll take your review as a constructive thing, I will continue writing about technology, because I'm new to the field, I enjoy it and I want to learn and improve my skills. I hope that you get involved with the book and send your erratas about the language and the content to packt, and we as community can get a better book about this awesome framework. PS: don't get me wrong, I'm not angry with you, and I'm not trying to be aggressive. I know that when you do something for the community the main idea is to get all the feedback (bad and good) to become a better person/developer/writer. PS3: sorry for my language mistakes, once again. I hope to see you in FOSDEM! By the way, I keep thinking about the sentence that mention ESB and Drools. 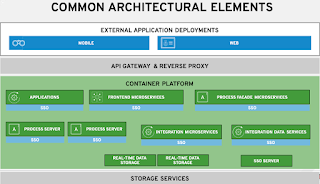 My experience tell me that 99% of the cases you need to communicate jBPM with some external systems and you have complex, real-life business logic. When I wrote the book one of the main problems was not talking about that topics in depth. You have questioned my experience, but in the other hand your experience seems to be very different from mine. We can discuss that in private if you want, I'm always open to a good discussion to learn new perspectives! Being a packt author myself I can surely agree on your point on the proof reading, but I can imagine that wouldn't give an opportunity to non English writers to deliver anything on time. Also, I'm sure RH technologies can benefit from any book as they also give more credibility to their solutions from the technical crowd. It seems the majority of the comments are upset with my review on the quality of the English in the book. I will clarify for those that missed my point. It is not a statement about the author. It is not his job to ensure (certainly not as a non-native speaker) that it is a solid English readable book. He is for the ideas, teaching and trying to bring the technical details to the masses. I feel that if I am to review anything that will cost a reader in excess of 48 Euro (price I have listed on the packing receipt and not incl. shipping), then I would be remiss in not mentioning the lack of PROOF READING and/or EDITING that the PUBLISHER is responsible for. Many authors in the world publish just fine with terrible English due to great publishing support (Manning, O'Reily, etc.). Stay tuned, review of chapters 1-6 coming up soon!